Inshore water temperatures in the Little River area in the mid- to upper-70s. Water conditions in areas like Tubbs Inlet are pretty clean with a typical summer, tannic color. 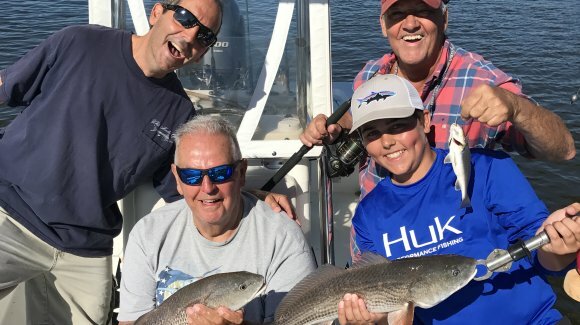 This has been a great early summer for inshore fishing, and Captain Patrick “Smiley” Kelly (843-361-7445) reports that the “big four” inshore species are all feeding well. Flounder fishing is improving as temperatures warm, and the lower to rising tide has been the best. The areas around Tubbs Inlet and Sunset Beach have been most productive. Fish will certainly eat live bait, but the biggest fish (including a 3.7 pounder in a tournament last weekend) have come on white Berkley Gulp! jerk shad. Fishing for slot-sized redfish has been pretty good, and there have been a bunch of 19-21 inch fish caught. On lower stages of the tide fish have been around docks and structure, while on higher stages fishing in and around the grass has been best. Fish will eat cut mullet, live mullet, Gulp! jerk shad, and Gulp! shrimp – new penny color has been best. It works well to present baits on a ¼ ounce jig. Lots of nice trout have been caught on live shrimp or Vudu Shrimp fished under a popping cork, particularly on the low to rising tide. Fishing around spartina grass or oyster banks that have drop offs in 3-6 feet of water has been the best bet. Around Tubbs Inlet, the Calabash River and Dunn Sound the fishing has been good. Although Patrick’s boat hasn’t done much of it, fish will chomp topwater plugs first thing. 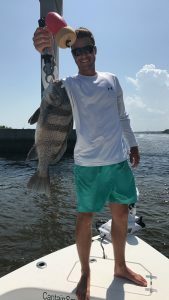 The black drum bite is hot, with fish eating fresh cut shrimp as well as live shrimp presented on a ¼ ounce jig and fished on the bottom. The low to rising tide has again been best, and the best fishing has been in deep holes such as those that have around 10 feet of water.